Time to play catch up… New pieces, discounts, upcoming auction & grab bags! Heya, friends! I recently sent out questionnaires for fundraiser grab bags, and I’ll be working concurrently on getting the first sets of grab bags together, working on the last of the older custom orders, and making new pieces for my shop over the next couple of weeks. I’ll try to get better about posting them here again as I make new pieces. In the meantime, if you are due a reward and haven’t found the email titled “Grab Bag Questionnaire”, please get in touch and let me know that you haven’t received it. 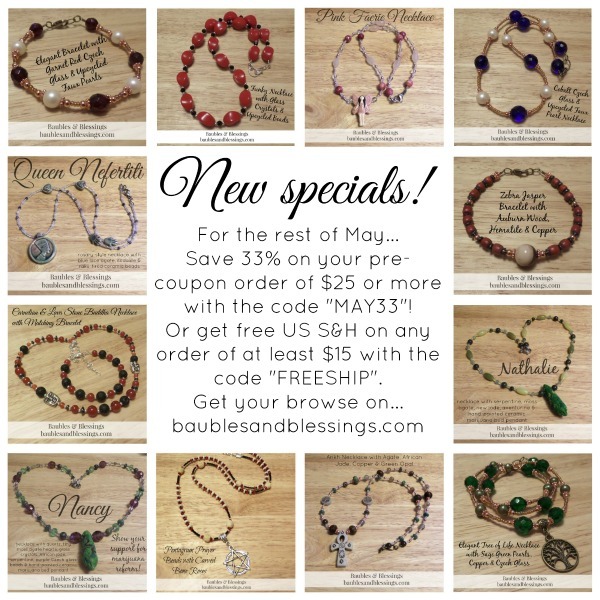 You can see my newest coupon codes to the left… Just enter the code of your choice during checkout via my shop, either “MAY33” to save 33% on any pre-coupon purchase of at least $25 OR “FREESHIP” for free US S&H on any order of at least $15. Both are good through the end of May. Oh, and before I forget… For anyone who missed it, here’s the screenshot of the donations your purchases in April helped me to make! I posted this on FB and forgot to share it here a couple of weeks ago. This isn’t everything I’ve made since my last major jewelry upload, but here are some of the highlights… Some of these are still available in my shop, and I’ll have more added soon! Among my personal favorites of this bunch are the marijuana bud necklaces. As a medical marijuana patient who went from being on high doses of narcotics and many additional pharmaceuticals just to be able to function, to now just using my MMJ and about half of the meds I was on previously — no more narcotics! — along with a healthier diet, I am amazed at how much better I feel. I’ve been pleased by the response so far, and I’ll continue to make marijuana-themed jewelry because I am a firm supporter of the legalization of marijuana for medical, spiritual and recreational use… Your purchase of any of those pieces will help you show your support for marijuana reform, and will also help make sure that this patient doesn’t have to go without her meds. If there is enough response, I’ll also start donating a percentage of sales of these pieces to organizations working toward reform. If you have suggestions for great orgs that are underfunded, please let me know! I’m always thrilled to have a chance to pay it forward after all of the help we’ve received along our journey out of serious poverty and the chronic threat of a return to homelessness. As always, thanks so much for all of your support, lovelies! It truly means the world to my little family.